Husband-and-wife piano team Ron and Barbara Shinn plan to continue the music after they retire from the School of the Arts this summer. Ron has been professor of piano and music theory since 2007 and Barbara has taught three-quarters time as director of class piano. They also direct the annual Piano & Chamber Music Institute, a summer program for talented high school students that will continue. “I hope we can collaborate on and possibly record additional four-hand music for one or two pianos,” Ron said. They will continue teaching pre- and post-college students with studios at home, where they have four grand pianos. Ron has presented numerous solo and chamber music recitals and he and Barbara have presented regular duet/duo-piano recitals. 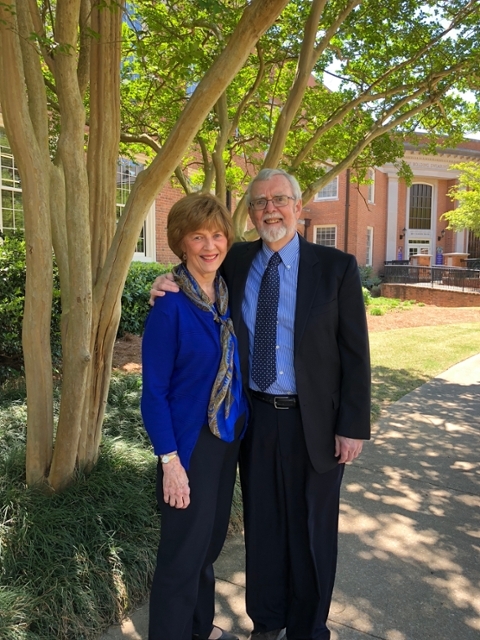 Ron said he would miss “talented and brilliant colleagues and wonderful students.” Barbara added that she also would miss working with undergraduate students. “Their enthusiasm is electric and invigorates me daily,” she said. The Shinns cited the move toward digital capability as the most significant change in their field. The Shinns also look forward to retirement travel, including trips to Boston to visit their four-year old grandson and new granddaughter. Their son, Michael, is dean of music at Boston Conservatory and their daughter, Anne, a senior grants manager at Columbia University’s school of public health.